They are the alternative pedestrian routes connecting the main streets of Hoddle Grid. They are classier and brighter than most of the ordinary graffiti-covered laneways. 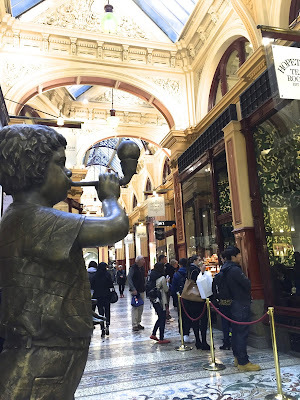 They are the perfect hideouts during chilly winter season, favoured by Melbournians on frustrating rainy days, frequented by avid shoppers looking for anything rare and exclusive, and high tea lovers longing for a true Melbourne experience. They are the straightforward shortcuts, impressive zigzags, and interesting mazes. Amongst the network of covered passages scattered around the city, Block Arcade enjoys the sole regal status. In other words, it is the Queen of Melbourne Arcades. Like a proud peacock, Block Arcade is a paragon of vanity, and has absolutely no qualms showing off its irresistible glamour. Opaque glass canopy shadowing the full length of the elegant passageway, intricately designed arches of wrought iron, meticulously crafted stones in its nineteenth-century Victorian style stretching gracefully under the roof, warm lighting that enhances the luxuriousness of the interior, Italian mosaic tiled flooring of elaborate patterns, classical triangular pediments; Each and every elements in the arcade screams lavishness and demands to be deeply admired. 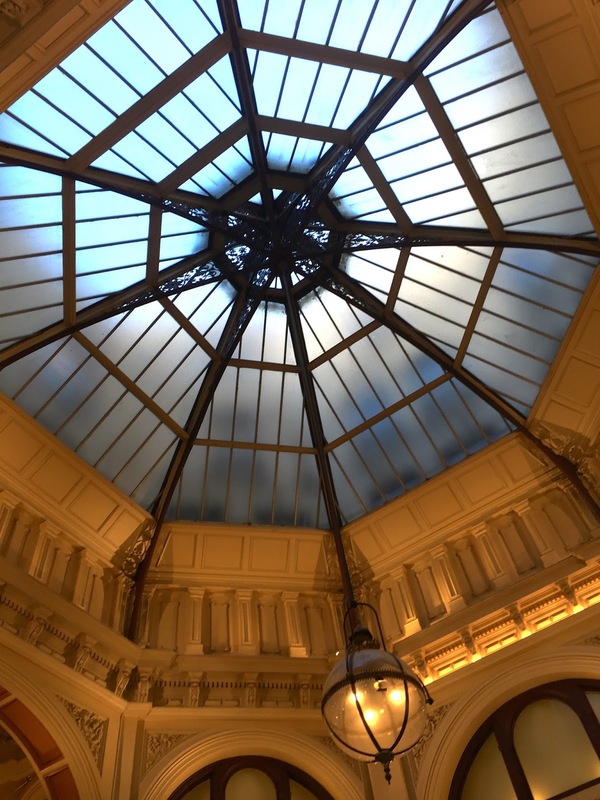 Save for perhaps the smaller space area and the not-as-grandeur glass dome, the arcade is an intentional copycat version of the famous Galleria Vittorio Emanuele in Milan. Constructed between 1891 and 1893, the elegant arcade is closely associated with the fervent ritual in the late nineteenth century, where walking up and down Melbourne’s most fashionable shopping promenade on Collins Street for the odd purpose of being seen in one best and finest apparel was the favourite pastime of many. The people were “doing the Block”, as the old Melbournians affectionately called it. 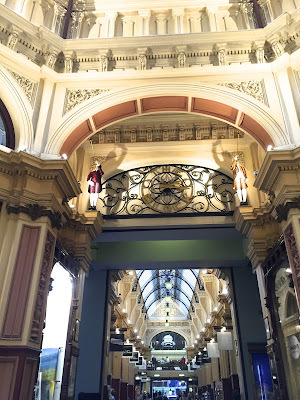 It is almost impossible for any serious or casual visitors to miss this heritage-listed arcade. Location wise, its bent L-shaped connects the premier Collins Street shopping area on the South and the bustling Elizabeth Street on the West. A separate “T-junction” is formed on the north where the exit opens up to a romantic new world called the “Block Place” - a partially covered narrow lane lined with intimate cafes, al fresco eateries and pretty little European-style shops. The arcade’s residents consist of a careful selection of prestigious retailers, whose classy styles and glorious taste are deemed to befit the Victorian theme of the premises. With history dating back to 1892, the charming Hopetoun Tea Rooms nestles comfortably at the front entrance of the arcade, patiently offering its patrons a taste of the bygone Victorian era with its sumptuous cakes, refined wallpaper in a splendor of green and gold, large etched mirror and mahogany chairs. The arcade also houses one of Australian oldest family owned chocolate makers since 1915- the Haigh’s Chocolates, a boutique offering range of exquisite alpaca yarn clothing, gallery of the legendary illustrator of children’s books and political cartoonist Dr Seuss, sellers of unique artworks, herbs and spices, collectable dolls, jewelleries and pearls, and the international brand Crabtree and Evelyn.